Polar bears feed almost on any type of meat. That includes ringed seals and bearded seals. They also eat walruses, beluga whale, bownead whale carcasses, birds, vegetation and kelp. Unlike other bears, polar bears do not hibernate or den in the winter. 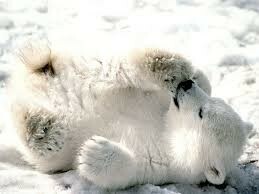 Pregnant Polar bears need to eat a lot in the summer and fall in order to survive the denning period. The mother will then nurse their cubs till they are 20-30 pounds before emerging from the den in March and April. Their mating seasons are in late March and May with the expectancy of 1-4 cubs. Female polar bears will locate their denning site either on thick packed ice or on land. Because of global warming, polar bears are having a hard time trying to find food and making/finding their dens for their cubs. Because bad oil and gasses are spreading to Polar bear habitats, the bears are forced to either move or find a different way of living. Grizzly bears are omnivores, and eats both plants and flesh. They eat things like berries, roots, insects, grasses, fish, sedges, and more. In the past, there were 50,000 grizzly bears in Northern America, but today there are only 1,000-1,200 of them in 5 different populations in the lower 48 states. There are about 30,000 grizzly bears in Alaska, Grizzly bears hibernate during the winter for 5-8 months. they eat a lot of food in the summer and fall in order to build up sufficient fat for surviving the time of hibernation. During breeding, they live in areas with a super-abundant food supply such as salmon streams. Mating season starts in early May through mid-July. 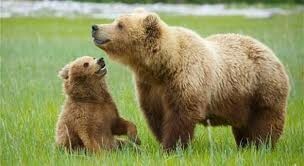 A grizzly litter size comes in 1-3 cubs. The cubs are then born in January or February while the mother is hibernating in a den. The cubs will stay with their mothers for at least 2-4 years. Because of human action and global warming, the bears moved to rugged mountains and remote forests from the great plains. Grolar/Pizzly bears are a type of hybrid between a polar bear and a grizzly bear. They can either be called a Grolar bear or Pizzly bear. 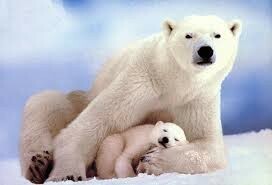 They are called Grolar bear when its father is a grizzly, and is called a Pizzly when its father is a polar bear. A Grolar/Pizzly bear is smaller than a polar bear, but larger than a grizzly bear. They have long necks like a polar bear, but has small shoulders like a grizzly bear. The sole of their feet is only partially covered in hair. 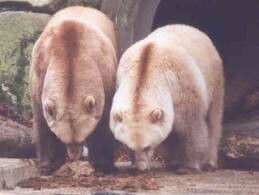 Because they are a hybrid between a polar bear and a grizzly bear, they have a diverse diet. They also have a diverse habitat from the Arctic to the mountains and forests. Grolar bears tend to fill in different ecological niches. Because Grizzly bears tend to stay and breed on land while Polar bears prefer to breed on the ice, the result of the Grolar/Pizzly bear can choose any of them. Because global warming is causing ice to thin and cause polar bears to move further inland, It is possible that this can cause the increase in hybrids. If this continues to happen, I believe that new species of bears will arise. Learn about the size, diet, population, range, behavior and other fascinating facts about grizzly bears. Learn about the size, diet, population, range, behavior and other fascinating facts about polar bears.